Local high school students recently participated in the Rotary Four-Way Test and performed exceptionally well. From left to right, the first place winner was Rebecca Lucas from Miami Trace; second place was Cole Karnes of Miami Trace; fourth place was Grant Patterson of Washington Senior High; and third place was Haley Maxie of Washington Senior High. Lucas will go on to give her Four-Way speech at the districts. The test, which has been translated into more than 100 languages, asks the following questions: Is it the truth? Is it fair to all concerned? Will it build goodwill and better friendships? Will it be beneficial to all concerned? The students are given four minutes and have to cover all four aspects of the test without using any notes. https://www.recordherald.com/wp-content/uploads/sites/27/2017/03/web1_SAM_0564.jpgLocal high school students recently participated in the Rotary Four-Way Test and performed exceptionally well. 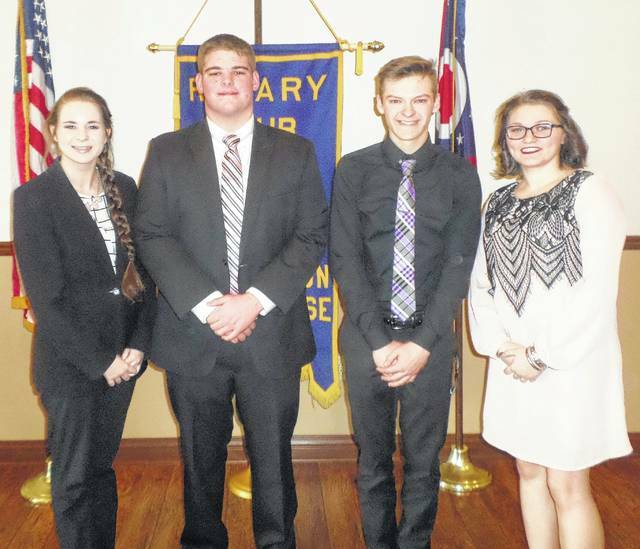 From left to right, the first place winner was Rebecca Lucas from Miami Trace; second place was Cole Karnes of Miami Trace; fourth place was Grant Patterson of Washington Senior High; and third place was Haley Maxie of Washington Senior High. Lucas will go on to give her Four-Way speech at the districts. The test, which has been translated into more than 100 languages, asks the following questions: Is it the truth? Is it fair to all concerned? Will it build goodwill and better friendships? Will it be beneficial to all concerned? The students are given four minutes and have to cover all four aspects of the test without using any notes.